Ola’s Interesting April Fool’s Prank Creates A Social Media Frenzy! | Unkrate | Creating Experiences. Ola’s Interesting April Fool’s Prank Creates A Social Media Frenzy! Known for its unconventional and fun April Fool’s Day campaigns, Ola successfully launched and executed its latest April Fool’s Day campaign, Ola News Network. Ola News Network was launched as Ola’s news vertical to deliver hyperlocal news. With the motto ‘#NewsYouCanUse’, Ola News Network was announced as a news platform where Ola’s 1 million driver partners, across 110 cities, would double up as on-ground reporters, sharing local city developments in real-time! The concept was launched with a short teaser, microsite, and an introduction video, detailing out the specifics of Ola News Network. Hitting the bullseye, Ola News Network’s crisp teaser and launch video created ripples all across the media landscape. The campaign created a stir on social media and attracted a lot of news and chatter from the who’s-who of the country’s social circle. Ola’s April Fool’s pranks have always been successful in making the right kind of noise in the industry. Over the years, Ola has played various pranks like Ola Rooms, Ola Air, Ola Wheels; launching them in innovative manner through videos, blogs, and social media banter. 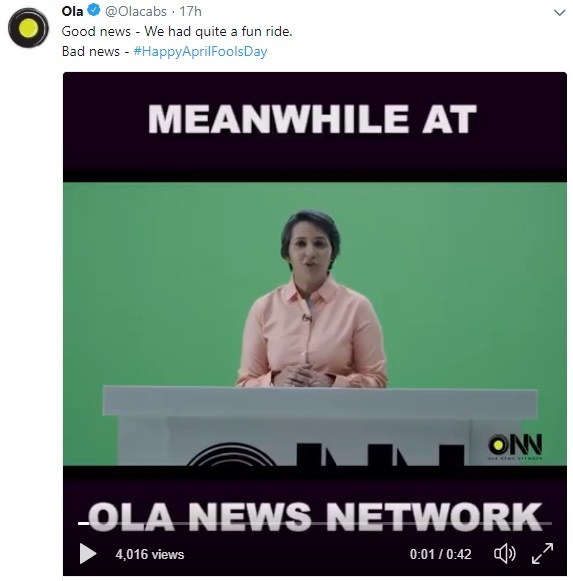 Ola News Network nailed the April Fool’s fervour, engaging as many as 17.5 million users and received over 108 million impressions on social media.